There is no other performer who looks and sounds so much like Elton John, nor any tribute artist that provides the experience of being at an actual Elton John concert, the way Gerald Brann and Yellow Brick Road does. Brann not only bears an uncanny resemblance to the international superstar, complete with his mannerisms and gap-toothed smile, but he meticulously recreates Elton John’s vocal stylings and piano playing to the letter. To truly capture the essence of the piano man himself, Brann dresses in custom-tailored replica costumes and Elton’s trademark sunglasses. A trained jazz pianist, Brann has been a lifelong Elton John fan, and his admiration for and love of his music comes shining through as he plays one hit after another with remarkable likeness to the pop music icon. For over fifteen years, Yellow Brick Road have set out to recreate an Elton Johnconcert, with the show being presented in such a way that will have Elton fans screaming for more! The band evokes audience participation throughout the entire show—whether singing along to “Rocket Man”, swaying to “Candle in the Wind”, hopping to “Crocodile Rock” or rocking out to “Saturday Night’s Alright For Fighting”. On occasion, Yellow Brick Road has also been known to throw in a few lesser-known deep cuts into their sets, a special treat for die-hard fans. 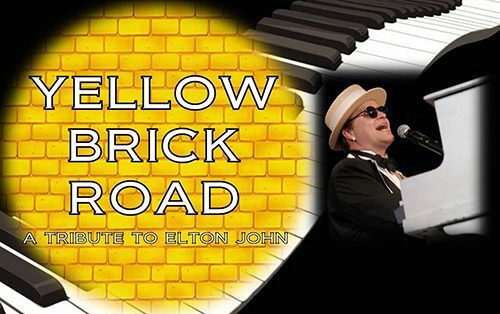 Yellow Brick Road is officially endorsed by Hercules, the International Elton John Fan Club, and performs at casinos, universities, concerts-in-the-park and aboard cruise ships.